Trash As Far As the Eye Can Sea | Do you know where your trash will go? Do you know where your trash will go? With population levels rising, and waste being produced and discarded at high rates, the world’s trash supply is growing rapidly. When thought about from a simple perspective, not many imagine that their trash may be washed up on a beach or mistaken as a meal by a marine organism. The reality is that about 8 million tons of plastic enters the ocean each year. 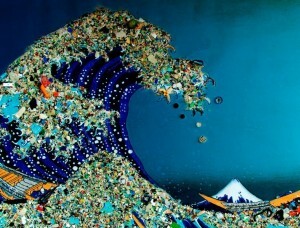 5.25 trillion pieces of plastic weighing 269,000 tons can be found floating in the global ocean. With thousands of species at risk for extinction, something needs to be done before the cry for help can’t be heard anymore. The main contributor to oceans is trash pollution. Trash enters these large bodies of water, such as the Great Lakes and Pacific Ocean, and affect many parts of the ecosystem that make it up. The future of the ocean and bodies of water throughout the world are at steak if nothing is done to solve the issue of water pollution. The disposal of trash is causing a problem in the most important bodies of water on Earth. Trash that is collecting in the ocean cases a harm to the marine ecosystem, organisms and life in the water, and harm to human health.